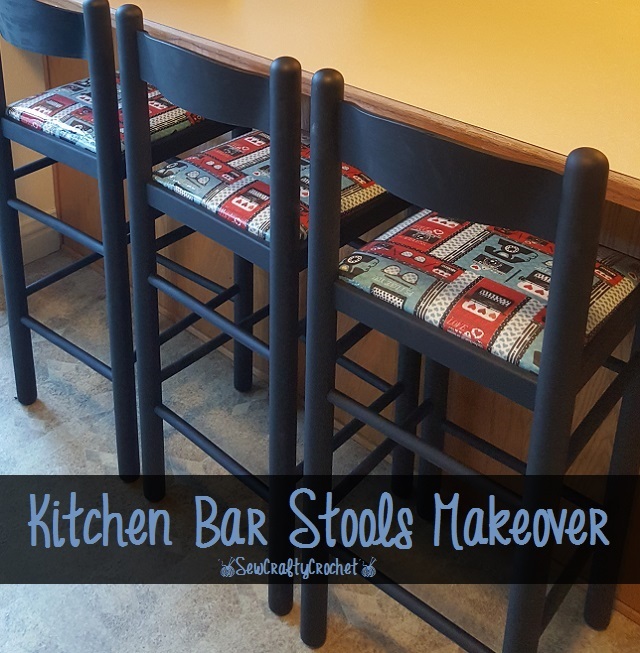 The kitchen in our home has a counter that is also a bar, so I was glad when I stumbled upon three bar stools at the local Goodwill. Although we have a dining room table, we prefer to eat at the counter and sit on our stools. It just seems like more fun! I've changed out the fabric on the seats of the stools a couple times, but I recently changed them up a bit more with some paint. 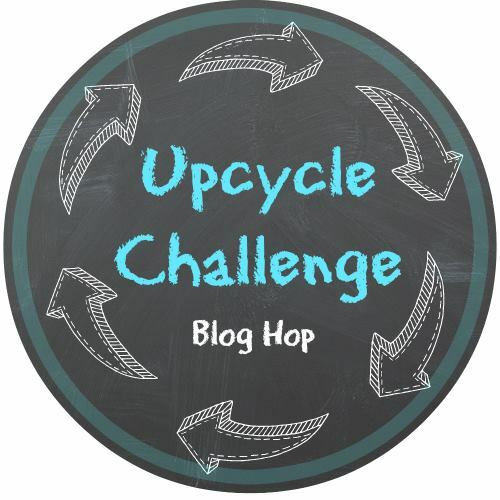 So I thought these stools would be perfect to share for the Upcycle Challenge Blog Hop. After checking out my stools, I hope you'll stop by my blogging friends' blogs to see what they found at their local thrift stores. 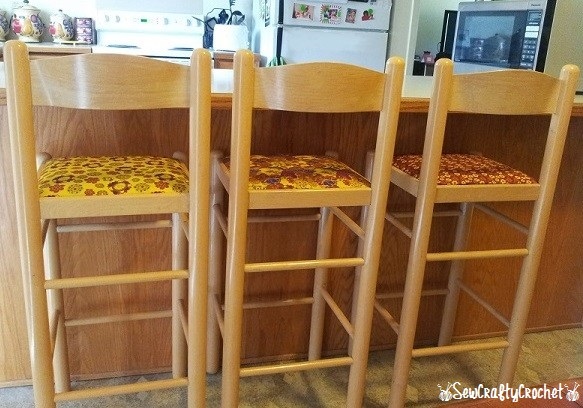 A couple years ago I bought the set of 3 kitchen bar stools at the local GoodWill. This is how the stools looked when I first purchased them. I did not like the fabric at all, and the seats were dirty. See.... The seats are dirty. I can't let my family sit on that! The first time I gave the seats new fabric, I chose fabric that matched my kitchen decor at the time. I had apples, pears, and grapes as the theme of my kitchen. So this fabric matched my kitchen decor very well. 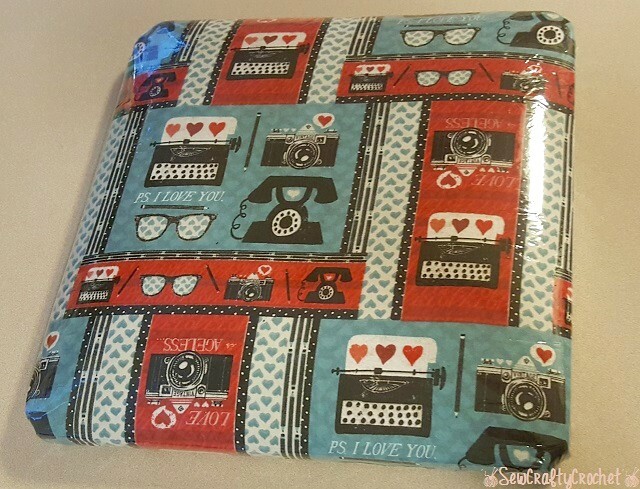 I bought this fabric bundle, and I thought it would be fun to cover the seats in coordinating fabrics instead of using the same fabric on each seat. Here are the stools after I changed the fabric on the seats. Later on, I decided to change the decor in my kitchen, and it had a new color scheme of black, white, red, and blue. So the seats needed a new makeover. This fabric is one of my faves! It's call Vintage Desktop. At first, I just changed out the fabric on the seats, but after a while, my two precious and messy kiddos made the fabric really dirty, so I decided to recover the seats, but this time I added vinyl over the fabric to protect it. I had to protect the fabric since I believe it has been discontinued. I used my last bit of this fabric to recover the seats. It's not a "kitchen" fabric, but the colors match my kitchen decor perfectly. And I love the styled fabric. During this makeover process, I decided to paint the stools. 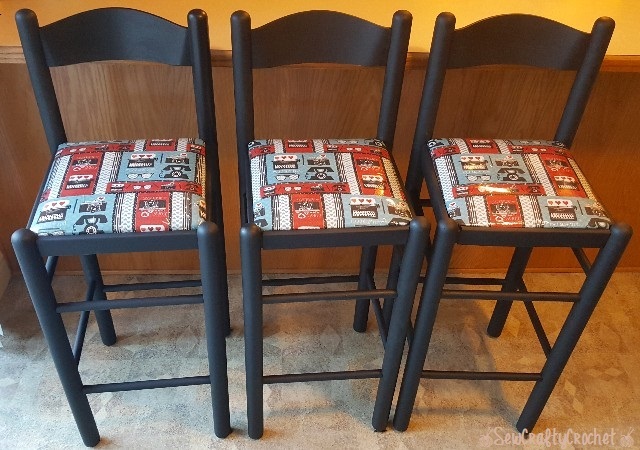 Since the fabric is black, white, red, and blue, I really wanted to paint the stools black, so I did! I used black chalkboard paint. Here's a glimpse at my kitchen. The fabric on the stools matches the fabric I used to make my kitchen curtain. I'm happy with how the stools turned out, and I wish I had painted them sooner! Your bar stools look great! The first makeover was pretty, and the second time around is fun, too. Painting them black along with the new fabric is a great look. Thanks Beverly! I wish I had painted them sooner. You did a great job on the stools! What a fantastic idea use vinyl! I agree - that fabric is so cute and looks great with the newly painted stools. Great project T'onna! Pinned and shared! 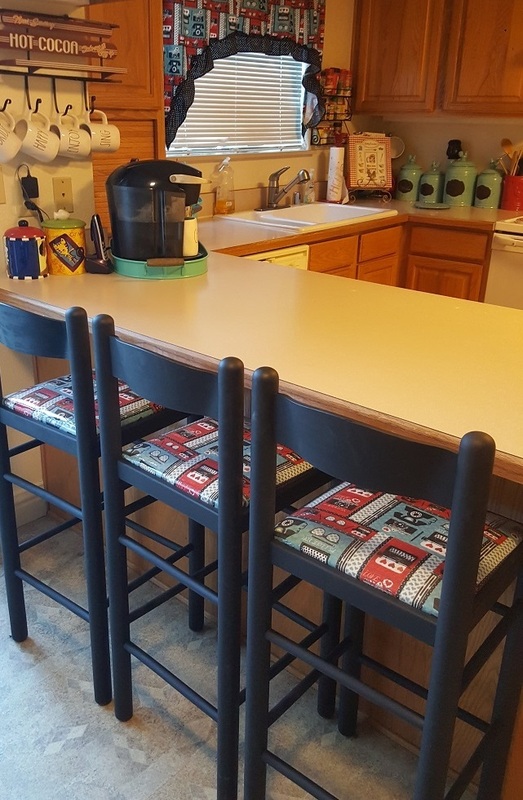 Your kitchen bar stools look great painted black and the fabric is awesome - nice job! Thanks Marie! I really love this fabric. T'onna I love what you did with the seats. The fabric is so cute and now that you have painted the chairs it is a perfect match. I also spotted those cute coordinating curtains. Good idea adding vinyl so you can protect the fabric. What a lovely transformation, T'onna! I love them black - they look so dramatic now! And I love how you re-covered them in fabric that matches your kitchen curtains. They say to use paint to update the look and painting your stools black really makes a difference. I love it! Thanks Gail! I love the black paint, too. The matte black paint looks wonderful on the stools -- such a great update from the original blonde wood. And, I love the fabric print. Covering it with vinyl was genius. Now, you can just wipe the seats with a damp cloth or even soap and water when needed. Great upcycle project!